I have a special needs sister. 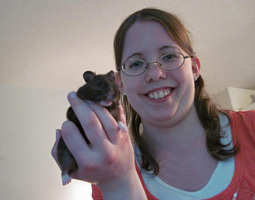 My sister Sarah has severe autism, and she is petrified of cats and dogs. When I wanted to bring an animal home, I had to be very careful of what kind of animal it was. 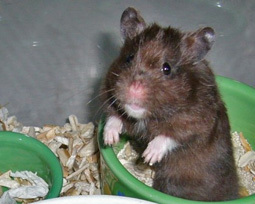 So I researched and looked around, and I decided that a hamster would be the perfect animal for me and my family. When I first brought him home, Sarah was so afraid of him! Sarah wouldn't even put one foot in my room, because she could see the cage from outside my room and she knew what was in it. And when he was in the ball and would roll into the room that she was in, she would run and find somewhere to sit down. Then she would put her feet on the chair, so that he couldn't even touch her with the ball. After the course of some weeks of her seeing the hamster and watching us interact with the hamster, she grew to love him. So much so, that when he would go to whichever room she was in, her face would light up. Sarah would even make happy sounds and dance around, too. After about a year of us having him with us, he injured his eye. And the cells in his eye, ended up dying. It caused him a lot a pain, so much so that he would cry out in pain. And I ended up having to put him down. Sarah really missed him. She would look for his ball and listen for the sounds of him rolling around. That was really hard to see, but it was also touching because she loved him.